Amarillo ACE general manager Mitch Zwolensky looked forward to the inaugural season of his wood bat collegiate league team in 2005 and he expected a strong level of play from his club, he told The Amarillo Globe-News. "The college game and pro game are two different games because of the wood bats," Zwolensky told The Globe-News. "ACE stands for attitude, concentration and effort. Our players will apply that to every at bat, every inning and every game." Zwolensky learned to expect that effort as part of a long career in the game as a player, coach and instructor. He played eight seasons in the minors and then coached in the minors and independent ball. Zwolensky's career started in 1981, taken by the Rangers in the 11th round of the draft out of Eastern Michigan University. He played his first season between the rookie Gulf Coast League and single-A Asheville. He made AA Tulsa for 1983. He went 12-10 there, with a 3.33 ERA. He also got two outings that year at AAA Oklahoma City. Zwolensky made Oklahoma City full time in 1984, going 7-8, with a 4.36 ERA. He returned there for 1985, making the 40-man roster. He played an abbreviated season that year and then moved on to the Cubs system. Zwolensky played two seasons as AAA Iowa, then got five final games with the Cubs at AA Pittsfield before a shoulder injury ended his playing career. Zwolensky then turned to coaching. 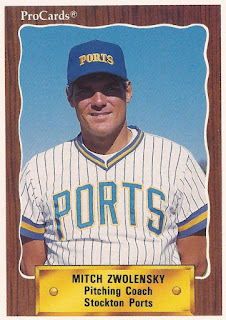 He coached with the Brewers at high-A Stockton in 1990 and 1991. He then went on to coach and manage in independent ball. 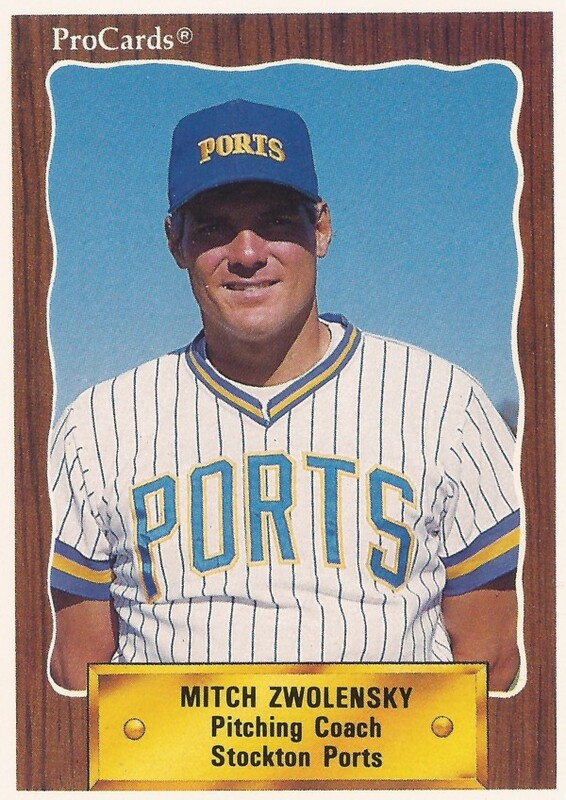 In 1997, Zwolensky made news as manager of the Minot Mallards of the independent Prairie League when his team's laundry didn't arrive until 25 minutes before the game and it was still damp, according to The Associated Press. He refused to let his team play after umpires rebuffed a second 20-minute delay. He argued and was tossed. The game went on, but the league ultimately suspended him for the rest of the year, The AP wrote. Zwolensky has also spent time as a scouting director and instructor. He's listed in 2015 as director of ACE Baseball Academy in Minnesota. My only memory of Mitch Zwolensky is that he was on the cover of the old Sport Americana Alphabetical Checklist books; "From Aaron to Zwolensky" as he was the last name in the book.